The Launceston Examiner let the cat out of the bag on 10 May 1938. Not only did it out Billy Costello as the voice of Popeye the sailorman, but it also let it slip that the alter ego of the spinach chewing mariner liked to play ukulele while yodelling expertly. If only to save face, we are told that Mr Costello was a speed-boat fanatic, too. He also liked to eat spinach, ,.. really. Billy Costello apparently modelled Popeye’s famous vocalising on the voice of his Irish-American father, who had been a drummer in Paul Whiteman’s band, and had partnered Ginger Rogers for two years on the vaudeville circuit. Benjamin Purnell, whom the Pittsburgh Press in 13 May 1923 described as a ‘long-haired, long-bearded old fox’, was the leader of a religious cult. Purnell claimed to have been the younger brother of Jesus Christ and that Purnell could give his followers immortality on earth. But in the mean time, he allegedly liked to keep the younger girls of the community in his own house. A nasty piece of work, he was. 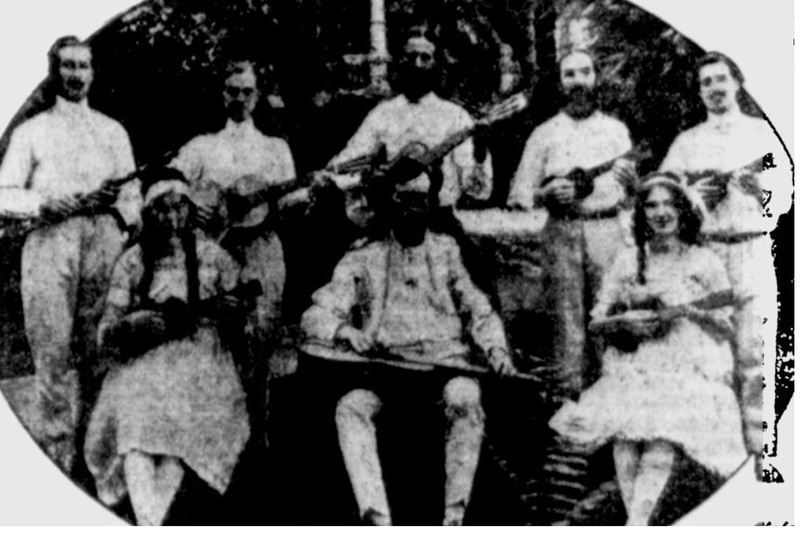 Never the less, the community did have a popular ukulele band. Music by Jerome Kern, introduced by Marilyn Miller. The Mail (a paper from Adelaide, South Australia) on 4 December 1954, told of the Chicago nightclub musician who was called in to play Dixieland music for some skittish pigs. The pigs were being prepared in a basement, not for the table, but for the International Livestock Show, but the new neighbours and their dogs started sniffing about, which upset the prima porkers. The only way found to calm them was ukulele music. Another good reason to learn to play the uke. In 1939, it was reported, George Formby deliberately threw his ukulele into the sea. The Sunday Times of Perth (9 April) reveals the George had collapsed during a performance at the Palace Theatre, and his Doctor told him that he had to stop playing the uke, not sing even for a child’s birthday party, and cut down his smoking to 6 cigarettes a day. Complete rest is what was needed or he’d lose his voice. So he hopped a boat to the West Indies, and, with a quick “Sorry old pal, but t’s got to be done”, threw the uke over the side. On a happier note, in December 1947, — obviously after a good rest — the Agrus of Melbourne reports that George received a standing ovation from the crowd at the Tivoli as few other performers ever had. “Sing us another one” was the constant call from the stamping and whistling crowd. He also led the crowd in some community singing in a way few other performers would attempt. The show was entitled, “It turned out nice again”.